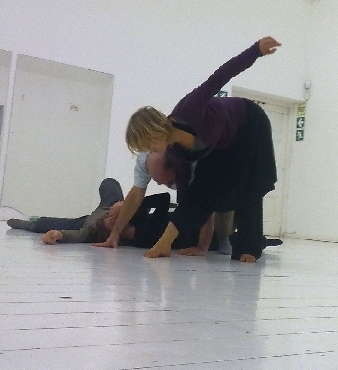 Last Friday we shared an evening of contact improvisation dance. Contact is a form of dance in which we use our bodies to communicate with one another. It revolves around the dialogue regarding the alignment of our centers, about offering to support another's and for the other to trust you enough to place him or herself onto your center. Interactions that take place in this dance are metaphors for life. For instance, the need to listen. But in this form, as it is a dance, the need to listen is about listening with your body to the bodies around you. As I move through the space, and encounter others, a dialogue ensues about whether I wish to take your weight, about how I wish to do so, and for how long. Whether you move in towards me offering, or away, removing. Just as in Tango, the couple communicates via their centers, by keeping them aligned and in a certain relationship, and thus can move together. In contact, it consists of an interaction of taking and giving, of supporting and being supported. Resistance is the way to hurting yourself or someone else. Resistance causes pain. Use the energy coming at you to flow into the new configuration. Each movement being an amalgam of your desire and interaction with your environment. Both have necessary constraints which will affect the outcome.